User – How do I export my contacts? 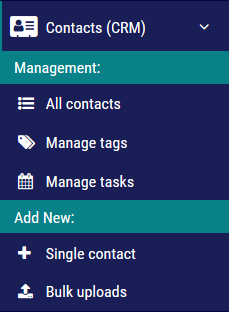 Step 1: Click on Contacts (CRM) on the left navigation. Step 2: On the bottom of the page, select All Contacts in the Select drop-down menu. Step 3: Click on the export icon button by Mass Actions to download a csv file of your contacts. Step 2: On the bottom of the page, select All on Page in the Select drop-down menu. Step 2:Tick the boxes for specific leads you would like to export. Step 3: On the bottom of the page, click on the export icon button by Mass Actions to download a csv file of your contacts. Customer support is available via support ticket. Our staff strives to answer your support tickets on the same day. However, during periods of high volume, please allow up to 2 business days for support tickets to be answered. © 2016 MyDigitalClients, LLC. All rights reserved.